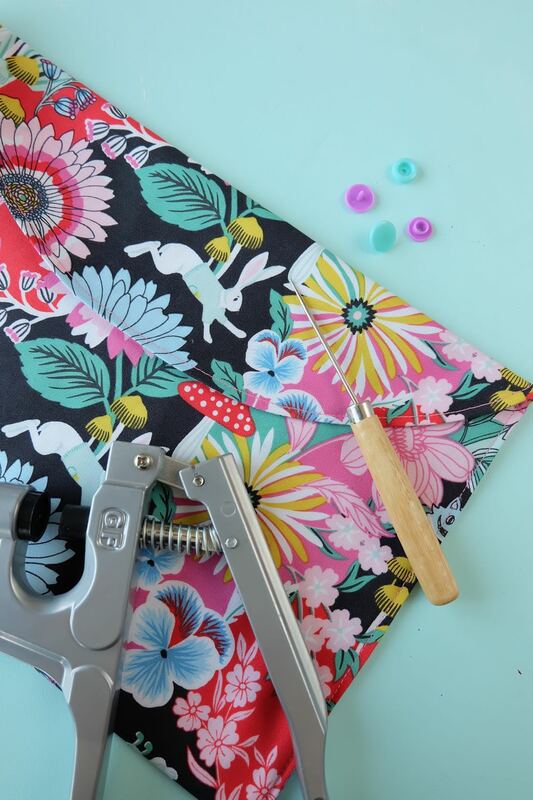 Looking for a fabulous sewing project for beginners? 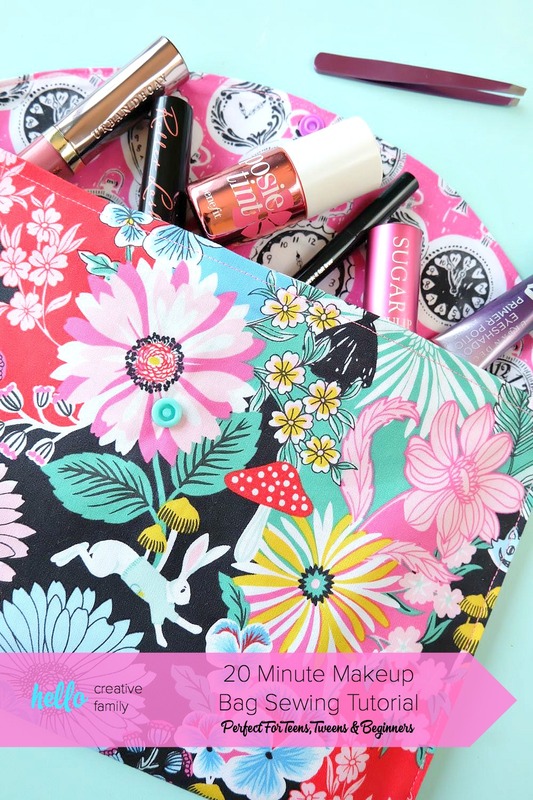 This 20 minute makeup bag sewing tutorial is easy to follow and leaves you with a fabulous handmade gift! This post is sponsored by the amazing team at Fat Quarter Shop. Today I’m going to share with you my sewing confession… I love to sew, but I don’t know how to sew using a sewing pattern to save my life! More often than not, when I have a project that I would like to sew in mind, I look for a pattern or tutorial, read it, get overwhelmed and then decide to just create one of my own. I can’t tell you how many times I’ve flipped something inside out to see how it’s sewn together or drawn out an idea of something that I would like to make on a piece of paper and then played with paper cutouts to try to figure out how to make it on my own. 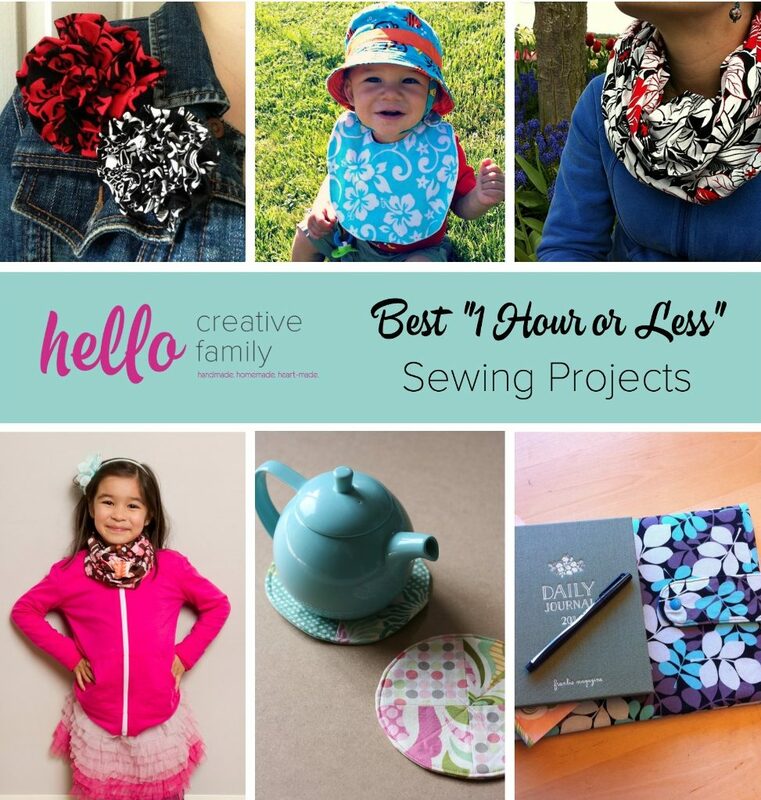 Because I’m so intimidated by patterns and complicated instructions, all of my sewing projects on Hello Creative Family are super easy to make! I also like instant gratification, so all of my sewing projects take 60 minutes or less to make. I’m a visual learner so I try to include as many step by step photos as possible so that you can see what’s going on every step of the way. All of these things make my projects ideal for teens, tweens and other people who are just learning to sew. A few months ago, my daughter took back the travel bag that I had stolen from her to store all my makeup. I went into my bathroom one day to find my makeup spread out on the counter and the bag missing. She was going on an overnight trip and needed her bag back. I decided that it was probably really time that I had a bag of my own, so I decided to sew one. I went on Pinterest for inspiration, but every bag I saw had a zipper! I didn’t have any zippers at home, and confession #2… I’ve never sewed a zipper into a project before so I decided to work with what I had on hand, pull out some paper, pencil and a ruler and design my own bag! The finished result was so fabulous and easy to make that I knew I had to share it with you all and Fat Quarter Shop agreed! One of my favorite places to buy fabric for my sewing projects is Fat Quarter Shop. Not only do they have amazing customer service, they also have a fabulous assortment of fabrics and sewing kits! I could honestly spend hours browsing through their site. I love how easy they make it to find coordinating fabrics in one line and buy them in one bundle. I always get caught up in cute fabric designs for the main part of my projects and always forget to think about the fabric that coordinates with the primary print that I selected. At Hello Creative Family our motto is that creative parents raise creative kids. We want to inspire that next generation of creatives. Sewing is a hobby that I learned from my mom. I still remember my first sewing machine, a vintage Singer sewing machine that my mom and I found at a garage sale that she had refurbished for me. I think that sewing is a wonderful project for parents and kids to do together and Fat Quarter Shop is right there on the same page as me! They carry fabric designs that will appeal to all ages! I can’t tell you how many moms that I’ve talked to who have told me that they have a sewing machine in the closet that they’ve never used because they are too intimidated to start. Today’s project is the perfect project for you. Have a teenager or a tween? Grab them and have them sew one up with you! Teens and tweens, you are going to love this project! Make the first one for yourself then make a ton more for all of your friends! Together with Fat Quarter Shop I want to encourage more people to start sewing! I thought I’d share some of my favorite fabric bundles from their site to inspire you! 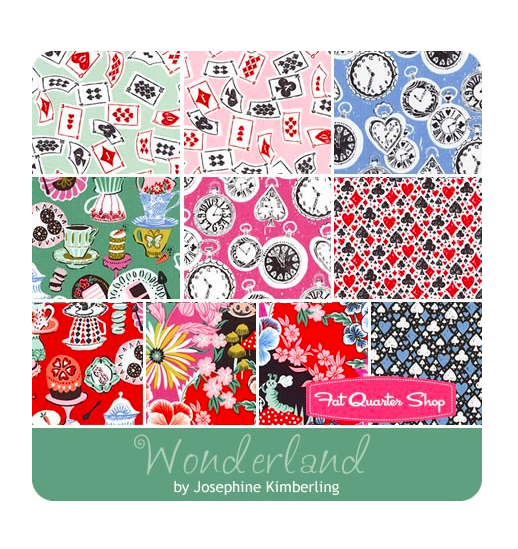 This is the Wonderland Fat Quarter Bundle that I used for my 20 Minute Makeup Bag Sewing Tutorial. 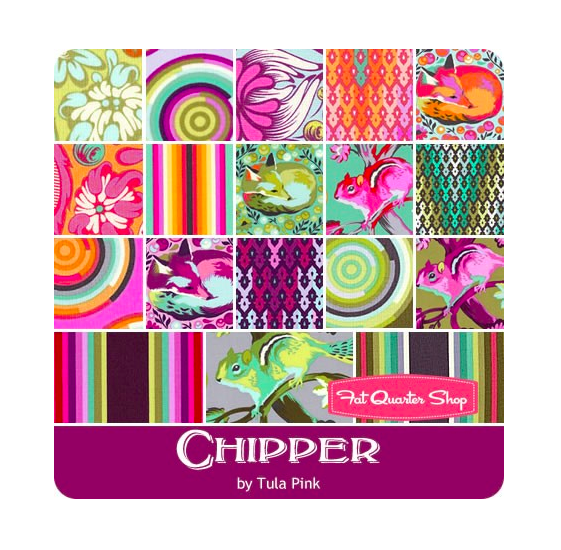 This Chipper Fat Quarter Bundle was another serious contender that I considered for my makeup bag. 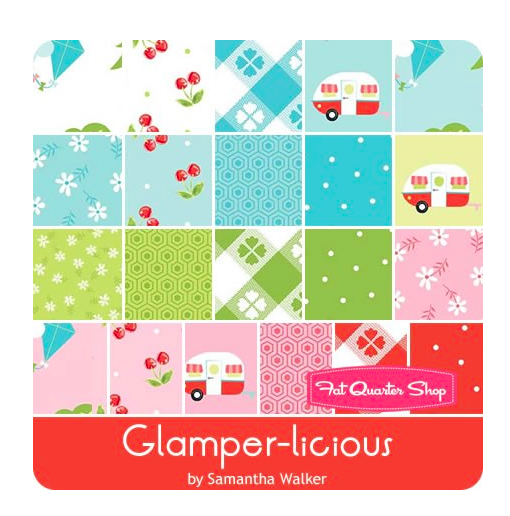 This Glamper-licious Fat Quarter Bundle has my heart all aflutter for summer camping! 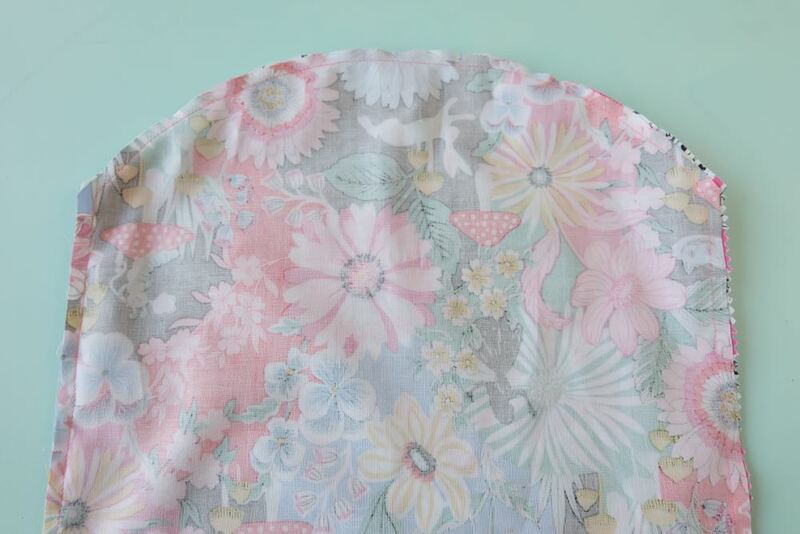 I also adore the pretty florals in this Abloom Fat Quarter Bundle. Fat Quarter Shop also sells fabric by the yard, Jelly Rolls, Layer Cakes, Charm Packs, Jolly Bars, patterns, notions and more! How would you spend your $100? Read on for your chance to enter the giveaway along with my 20 Minute Makeup Bag Sewing Tutorial which is perfect for teens, tweens and beginners! Step 2: Think about the orientation of your fabric. Does it have an up and a down? Lay your fabric out the way it will look as a bag (see picture above). If your fabric has a direction, you will want the outer fabric to be oriented so it’s upside down, and the inner fabric so it is right side up. The curve we cut in the next step will be at the top of both pieces of the fabric as it is pictured below. 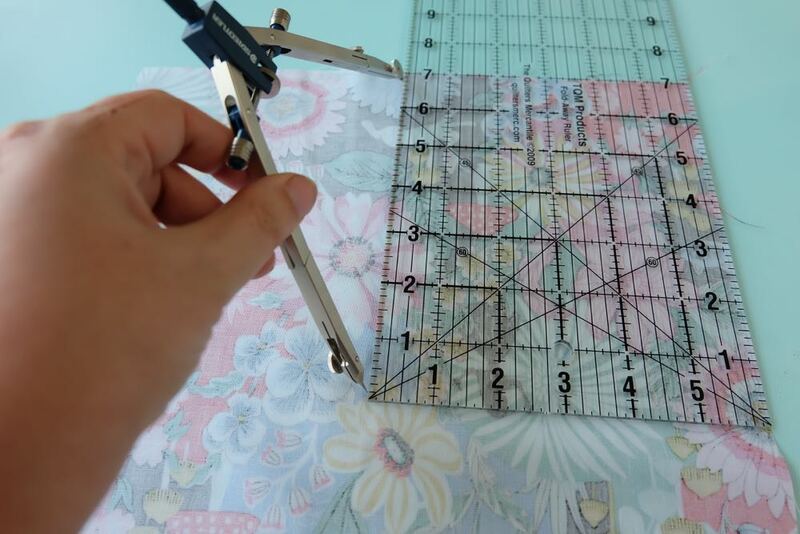 Step 3: Find the center of the width of your fabric (should be 6 inches in), measure down 7 inches and set your compass to 7 inches. Put the point of your compass at 6 inches in, 7 inches down. Use your compass to draw the curve that will be turned into the curve for the flap of your bag. Alternatively if you don’t have a compass you can use a pencil, thumbtack and string and use this method to make your curve, or find something large and rounded at home to trace for the rounded part of your bag. 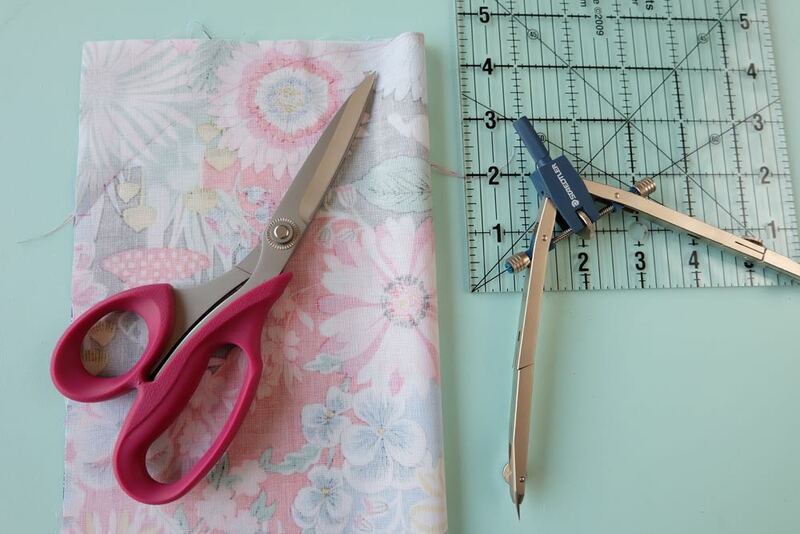 Fold the fabric in half, and using fabric scissors cut along the curved line you drew. The end of my curve meets the edge of my fabric 3 inches down. Repeat on your second piece of fabric. Step 4: Lay your two pieces of fabric on top of each other so that the printed sides of the fabrics is sandwiched in the middle. Line up all your edges and pin in place. Step 5: Using a 1/3 of an inch seam allowance, sew up one side of the fabric, around the curve and back down the other side of the fabric, leaving the entire length of the bottom straight edge open. Step 6: Flip your fabric so the design is right side out. 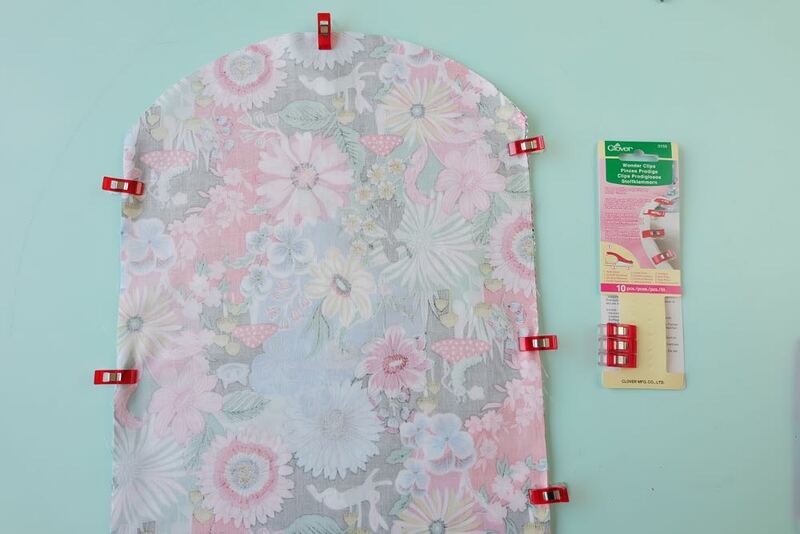 Use your iron and press your fabric, making sure to push the push the seams out to get your bag nice and flat. I use a chopstick to push at the seams of the bag from the inside as I press. Step 7: Take the bottom, open area of your bag (right hand side of the below photo) and fold the edges in by 1/2 inch, leaving a finished edge. Press in place with your iron. Step 8: Sew along this pressed seam to close the bottom of the bag, using a 1/4 inch seam allowance. Step 9: We’re almost there! This is where your bag really comes to life! With the right side of the fabric facing out, fold the bottom part of your bag up so it reaches the top of the curve of the top of your bag. Pin into place. Note: I designed this bag with the seams showing on the outer edges. Using coordinating thread, I think it’s a cute look. If you prefer to have your seams on the inside of the bag, simply follow the same instructions as above but have the liner of your bag facing out, then flip your bag right side out after step 10. Step 10: Using a 1/4 inch seam allowance, sew up one side of the bag, around the curve, and down the other side of the bag. Step 11: Now it’s time to finish the bag! Pick out coordinating snaps for your bag! 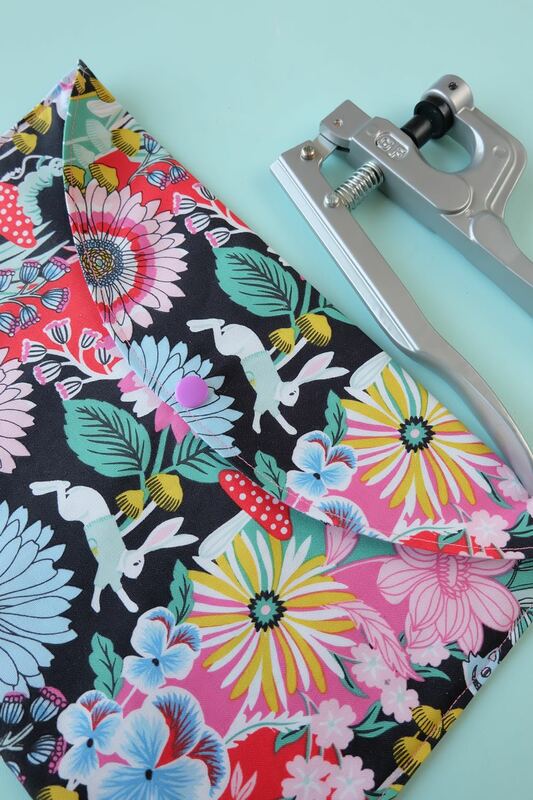 Use your snap pliers and add snaps to your bag so you are able to close it. Alternatively you can apply velcro to keep your bag closed. That’s it! Your bag is done and all in 20 minutes! Pack it full of your makeup, travel essentials, or even use it as an envelope purse! These little bags make great gifts for the women in your life and would make lovely gifts for Mother’s Day, Teacher Appreciation, Christmas, and bridal shower gifts! 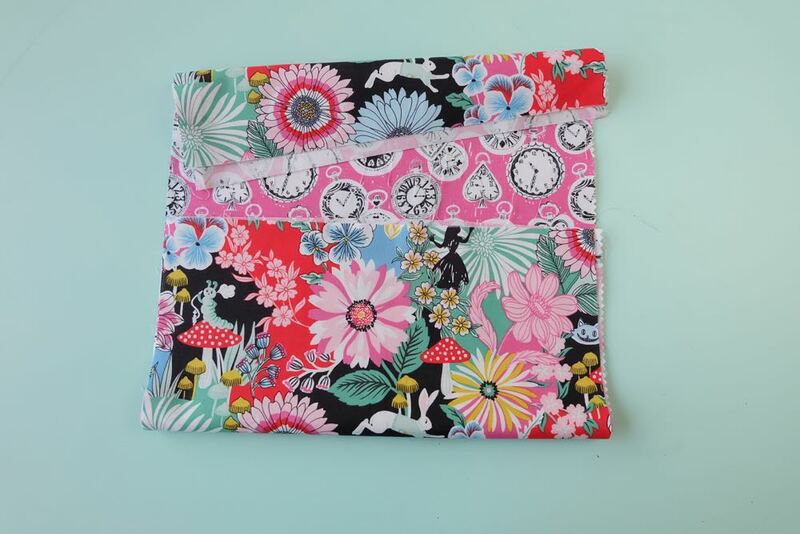 Tell me… What kind of fabric would you use to make this makeup bag and who would you give it to? What sewing project would you like to see us tackle next? Want more sewing inspiration? Make sure to check out our sewing category and to visit my profile on AllFreeSewing.com! I would get at least 3 of their sushi rolls, with the 42 2.5″ x 42″ strips of different fabrics. They would be so perfect for the rope basket I make with my mom. Thanks for the chance! There are some new prints from Art Gallery Fabrics that I’ve been dying to et my hands on! I would love to get my hands on the Sapphire Sea Moda Mix Fat Quarter Bundle. Such a beautiful color! I’d buy the Lovebug cuddle kit! I’ve made several make-up bags for myself and friends. They are always appreciated! I like yours with a snap…will have to try it! One item I”d buy at Fat Quarter Shop is the Orange Peel templates. I love those projects with that applique! I would buy the 30’s Playtime 2017 Fat Quarter Bundle Chloe’s Closet for Moda Fabrics. Love this fabric. I would love to use the certificate to purchase materials to make these makeup bags for all of my Rainbow Girls!! I would get some of the Glamper-licious Fat Quarter Bundles. would make a great quilt for our RV! 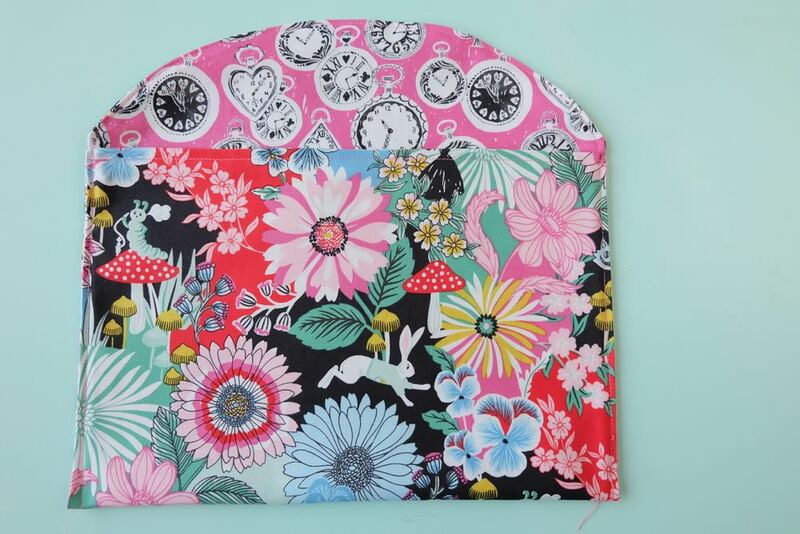 I am in love with the Wonderland bundle, especially the main fabric used in the make up bag! I will definitely be buying it! 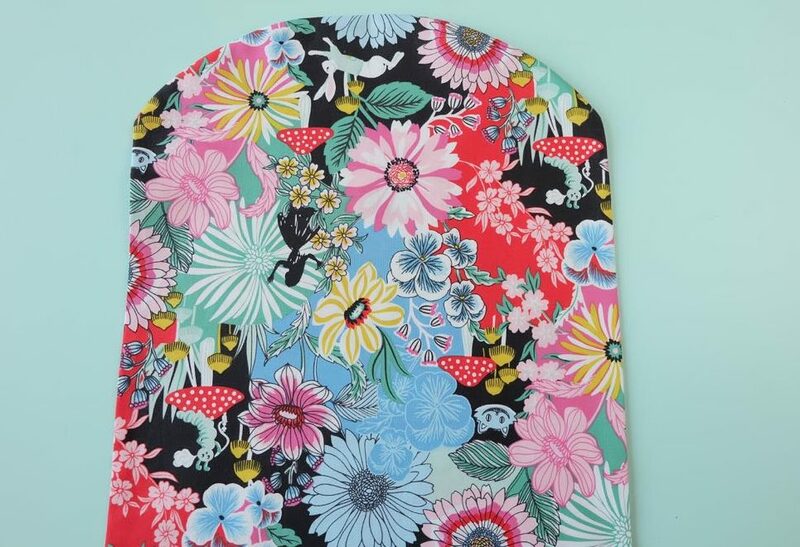 Elea Lutz for Penny Rose Fabrics. I love how bright and cheery it is! Sooooooo much to choose from!! Arrrgh!! :) Right now..love “Spring-A-Ling” Fat Quarter Bundle!!!!! I would get the new releases of Christmas fabrics! I have big plans for Christmas quilts, the sooner the better!! Good Day, your 20 Min. make up bag is right on time for summer sewing as I’ll be mentoring some tweens. It’s so cool to know you are keeping this art alive. Thank you! I’d love to have all of April Rhodes yardage in “Arizona After”, Essex Linen in many colors and lots of Aurifil 40 and 50 wt threads in grey, sandstone, dark turqoise. Oh my! So much gorgeous fabric! I think glamper-licious has my heart though! It’s so hard to pick!! I’d definitely get some of the denim though!! I would buy some Mochi Linen dots and a bunch of Robert Kaufman fabric. I would love to get the Taupe Box Aurifil Thread Box. I would like to make a patriotic quilt with American Swatch Book Half Yard Bundle. So many wonderful things to choose from! I think I’d purchase the Back Porch Prints bundle. I would purchase the new Cow-Folk boy fabric bundle and some charm packs. It is so cute!! I’m working on Tula Pink’s 100 Modern Quilt Blocks, and I’d love some Tula Pink fabric. And maybe some pretty Tula Pink scissors as well. I would love some yardage of Heather Ross’s Sleeping Porch line! I would buy fabrics from the Eek Boo Shriek collection. I would purchase various flannel fabrics to make some receiving blankets. I want to sew some to donate to a charity cause that my sister heads up. I lobe the FQS and they never disappoint me. I would put it towards one of the Half Yard bundles, maybe the Atlas Half Yard Bundle Another Point of View for Windham Fabrics if still available at the time. I love the FQS. I would put it towards a half yard bundle, the Atlas Half Yard Bundle/Another Point of View for Windham Fabrics bundle if still available at that time. Anything by Me and My Sister for sure! Your pouch is delightful! I’m definitely going to use your tutorial to make one for me and a few others for gifts. Thank you! And thanks for this great giveaway too. I love the selection at the Fat Quarter Shop. I’d get a fat quarter bundle of Neptune and the Mermaid. It’s such fun fabric. I really need some solids so that’s what I’d get. 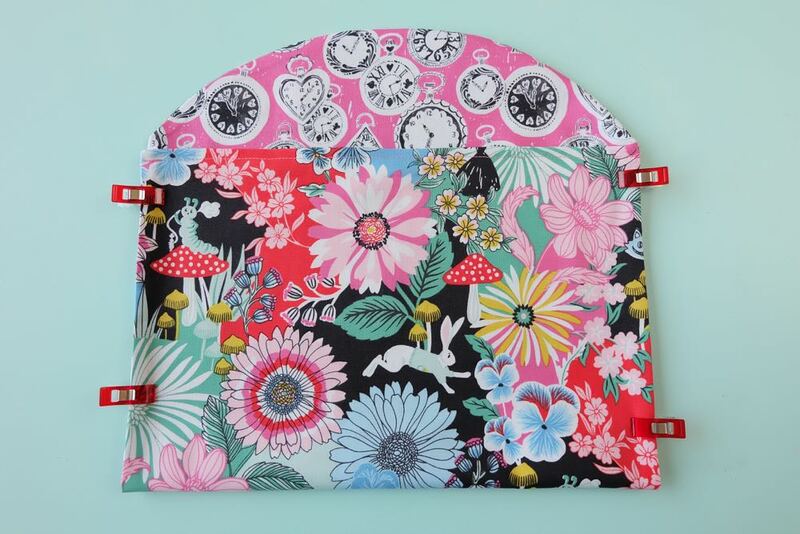 I’ve also been eyeing 30’s Playtime and some of Bonnie and Camille’s fabrics. They’re so pretty! I like the black and white fat quarter bundle. My daughter would love something made from these. Not sure what the end product is yet, but I love the patterns. I love the Duck Animal Quackers fabric for a baby quilt for a future little one. And also Old Glory Stonehenge for a quilt for my patriotic husband. I want the Lower the Volume half-yard bundle by AGF for Art Gallery Fabrics. I could use it for so many projects! I would apply it to the 6 yards in the Hello Gorgeous Pink One Yard Pack My Mind’s Eye for Riley Blake Designs, plus some Hello Gorgeous Cream Vine yardage. American Jane for Moda Fabrics is something nice I’d get. I would like to get some flannel for a rag quilt like the Cozy Cotton Flannel Marine Pineapple Rings. Batiks would be my first choice. I love the Boo Crew Fat Quarter Bundle Maude Asbury for Blend Fabrics. I’m a huge fan of Halloween styles! I’m torn between picking fabric that is in my comfort zone (reproductions) or step out of the box and choose some Kaffe Fasset. Regardless which direction I go, it will be so much fun choosing. I like the Complete Cute Sewing Tin Set Lori Holt of Bee in my Bonnet and some Christmas fabric. I would love the Antique Rose Ink Tiny Roses Yardage fabric. 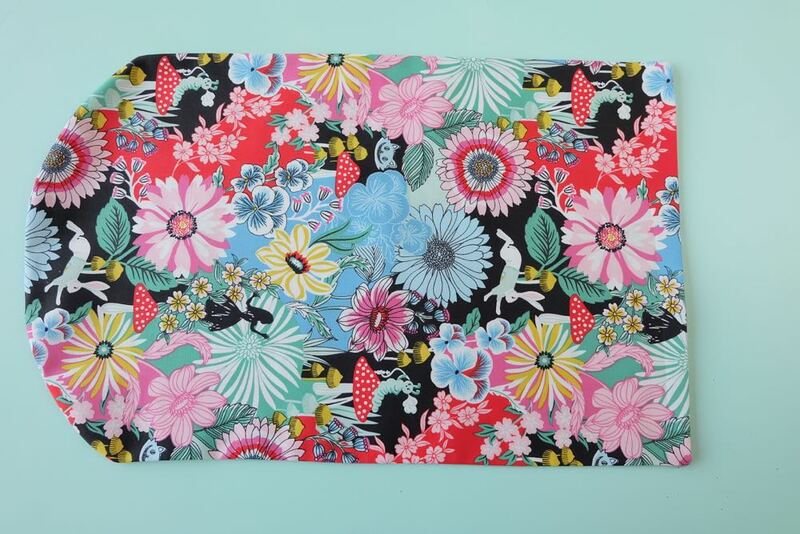 I’d buy the Abloom Half Yard Bundle byAGF Studios for Art Gallery Fabrics. I would buy an assortment of Cotton + Steel fat quarter bundles! I would buy the Artisan Half Yard Bundle Kaffe Fassett for Westminster Fibers. Tula pink true colors fat quater bundle! If I won, this would be a gift for my mom. She loves to quilt! Adorable project! I also have a difficult time using patterns, but this looks easy enough to give it a try. I would use $100 on some cute fabric that I NEED in order to make an extra long pillowcase for a body pillow. My sister-in-law loves to quilt and my nephew loves sharks so I would surprise them with some shark fabric – https://www.fatquartershop.com/surfs-up-ocean-sharks-yardage. I would stock up on backings for the quilts I need to quilt! I’d like to get an assortment of colors from the Cotton + Steel Solids collection! Thanks for the cute tutorial! I’d love to get my hands on a Flower Mill VS bundle or layer cake! Also, that suits print from your Wonderland bundle would be fabulous for the Rummy/Tripoley mats I make in my Etsy shop! I think I’d love to get a Quilt kit! I would get some Aurifil thread, some Tula Pink and Pat Bravo fabric… by the yard. 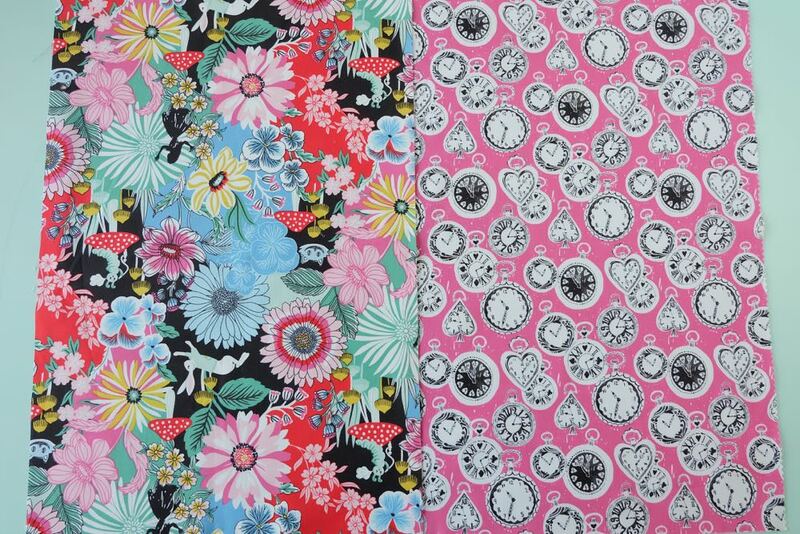 I can see making a summer outfit from one of these fabrics. I would buy the sapphire sea moda mix and crafters bundle. Thank you very much. So hard to choose, but I might have my eye on some Luna Sol, Tattooed, Fragile, and Grunge – Hits the Spot! Thanks for the chance to win! I’ve got my eye on some new Tula & a few other recent lines! What a fun, quick and easy project!! Thank you for the idea – and the fantastic directions! Precuts, fat quarter bundles in particular. I need more aurifil thread and some solid color fabrics. Very nice and easy pattern. Love the fabric choice. Great gift idea. This bag is perfect for a small gift I have to make this weekend!!!! Love It! If I win I need Christmas fabric to start on gifts. Only 193 days to sew! I would definitely buy some of that new line Glamper-licious and some Aurifil thread! It would be wonderful….. Thank you for giveaway! I already have a wish list for FQS as it is my favorite shop for quilting fabric and wonderful supplies. Anything Alison Glass or solids! The Hello Jane collection from Allison Harris really makes me purr! I would have to buy yardage of this entire collection if I won the giveaway! I’d get the heavy duty snap pliers. I’ve never used snaps before on one of my projects, but I love yours and how easy they look to install. What wouldn’t I choose?! I think i would get some Elizabeth Hartman fabrics, like Reef or Paintbox, and her Sleepy Sloth pattern. Aurifil thread to match, and maybe even a new rotary cutter! I would get the cuddle crib size kit for my Granddaughter who is due in a couple weeks. It is the perfect colors and has cute elephants! My daughter in law would love it for the nursery!! I love Fat Quarter Shop! It would not be hard to spend $100 there. I would really like a nice iron. I’m thinking I’d put it toward the Purple Precision Smart Limited Edition Iron. I have been coveting the Sleep Tight fat quarter bundle by Sarah Watts. She is one of my favorite designers. I would definitely buy the fabric from this project! I would buy some of the Literary collection but I have many items on my wishlist at the Fat Quarter Shop. Fabric! ! Most likely cotton and steel or tula! I’d buy the Filigree quilt kit and the Happy Snowman quilt kit. I’ve had both on my wishlist for ages! I am a huge Olaf fan lol! I have a ton of stuff on my wishlist at Fat Quarter Shop, so trying to pick was tough. They are the best, so it makes choosing hard! I’d buy loads and loads of solids. I’m currently curious about making quilts from solid fabrics. Great project -picking out something to buy at the Fat Quarter shop is always difficult since there are so many wonderful choices. But right now it would Christmas fabric. This is a cute idea. I could see hanging one by my daughter’s desk to hold papers. I would love to buy fabric from the FQS (who wouldn’t!) Either Sweetwater or Lella Boutique are my favorites. I would buy some of the cake mix papers, some rulers and Christmas fabric. I would probably get the Spring-A-Ling” Fat Quarter Bundle! Thank you so much for the opportunity to win a chance to buy some amazing fabric! I would love to get some adorable our to or fabric to make a matching set of bibs, burp rags, and a blanket! If I won the contest I’d buy fabric with my sister! We always have our eye out for what fabrics we like best. We’d narrow down our list and hop on to the website for some fun! I would get a quilt kit :) thanks for this opportunity! I would buy a bunch of fat quarters to make a quilt. I would probably buy some FQ bundles. I saw quite a few that I would love to have! I’d love the Hello Spring Quilt kit! Those neons are just my style! Thanks for such a great giveaway!! I would love to buy ALL the fabrics. I have some small projects on my to-do list and I am excited to look for colors JUST for me. I love this bag and the fabric is awesome! If I won, I’d probably get a jelly roll with a pattern- I’ve always wanted a jelly roll but somehow have never gotten one! I would love to win! I need a boost of creativity! Love this bag, simple but efficient! My daughter is clamoring for one already! I’d buy a Grunge Hits the Spot Layer Cake and a Cake Mix Recipe #2. There are so many great retro fabrics but I’m loving the indigo summer package. I would buy a bunch of Charleston fabric by Amy Sinibaldi! There’s so much I love but I would probably go with some boy themed fabric since it is hard to find anything cute in our local stores. Awesome bag. I would purchase Fresh Market White Large Floral by Bella Blvd for Riley Blake Designs or something similar to use as a backing for a king size quilt. Thank you for an amazing giveaway! I would buy all the Kona blues. I’m going to be a grandmother in November to a boy. Aurifil thread!!! Throw in a few fat quarters or charm packs too! I would get layer cakes and charm packs. I like assortments so that I can mix and match fabrics of the same makers. I would buy the new Bee Badics fat quarter bundle! I would love to try some C+S Sulky thread…or buy a Bee Backgrounds FQ bundle…or some Essex linen….there is no end to my FQS wish list!! Love your bag and fabric choices. Fatquartershop is one of my favorite places to shop. They have so much eye candy! I would definitely put a fat quarter bundle from Kaffe Fasset in my cart. I also want to get the aqua Alphabitties set. I have the pink set and love it! It’s a wonderful way to keep things organized. I love any and all fabrics, I would just love to shop FWD! I would get North Woods jelly roll. Also I would like some Christmas layer cakes. Getting ready for Christmas in July!! II would just have to buy a fat quarter bundle, but which collection? It wouldn’t literally takes me hours to decide but I’m really loving the Bread and Butter collection. And thanks for this fabulous tutorial. I’ve been trying to decide on hand sewn gift that I could make for my farmgirl group. This is definately the one. Love how I can personalize it for each friend with fabric that is see for each gal. Wonderful! I would get a Meriwether fat quarter bundle by Amy Gibson and a Bee Backgrounds stacker by Lori Holt. 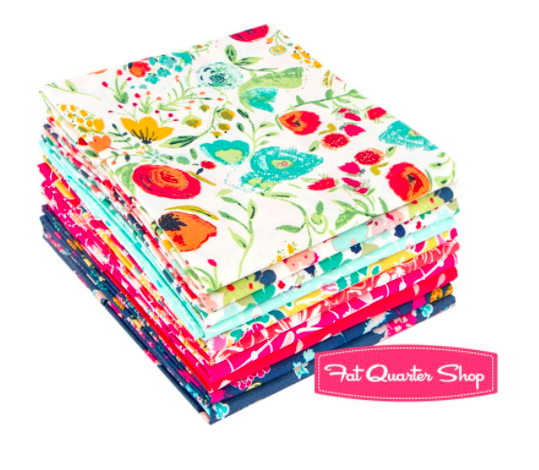 I would love a fat quarter bundle from Elizabeth Hartman. Love everything she does. I’d buy the Sunday Drive by Moda fabric I need for Pat Sloan’s Roundabout quilt pattern! Oooooo! Pick me! Please! In love with all the collections! I love the makeup bag tutorial! It’s a great use of leftover fabric too. If I won the Fat Quarter Shop giveaway, I would buy fabric to back some quilt tops I have made but need finishing. ? I would love some new threads and some Tula Pink fabric! I would get one of the quilt kits so I can make my daughter a quilt. I am not sure which design because I would let her pick if if win. I would buy The Good Life collection by Bonnie & Camille when it comes in. If I won I think I would buy some “I Spy” layer cakes so I could make a picnic quilt for my granddaughters. What fun to imagine what I would get! I have been eyeing a couple of Lori Holt’s fat quarter bundles for the Bee Happy quilt along. I would buy the Moda 30s Playtime 2017 fat quarter bundle. Ooh! This looks like a great project to do with my daughter this summer! I LOVE the Alice themed prints ? 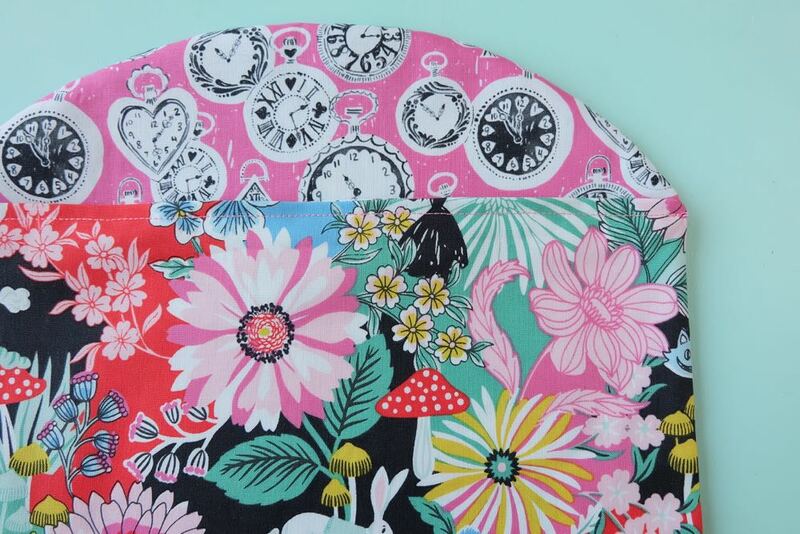 I would get the alice in wonderland fat quarter bundle. I would love to buy bright florals and sweet polka dots. I am obsessed with clothes for my dailughters dolls and hair accessories. I am going to try this tutorial too. Can’t have enough little makeup bags. I know my 11 year old would love it. My daughter wants to give out some makeup goodies for her 13th birthday and I think this would be perfect to put them in! I am a beginner and just got a sewing machine. I am a senior citizen and retired and decided that if I didn’t learn to sew now then I never would. I think this make-up bag would be a perfect project for me. Thank you for posting the directions! Very comprehensive post and I would like to buy Glamper-licious Fat Quarter Bundle. I made the cosmetic pouch with one modification. I couldn’t mark a symmetrical curve to save my life, so I cut a triangle at the top. That, I could do with a ruler. So it is an envelope style, but still looks quite nice.